Also, in a verse from the Sama-veda, starting as: tathaham krita-sannyaso bhu-girbanah avatarisye, the Supreme Being says that He will descend to earth as a brahmana-sannyasi at a place on the shore of the Ganges. Again and again He will chant the names of the Lord in the company of His associates to rescue the people who are devoured by sins in the age of Kali. "He is the most Benevolent Supreme Divinity [Mahaprabhu or the great master], as [through sankirtana] He graciously instigates [or bestows] intuitive wisdom in the jiva soul unto its fully developed cognition or purest attainment. This attainment of purest state or immortality is possible only by His grace as He is the Supreme Propeller and Imperishable Transcendental Enlightening Force." Within this conversation they further relate an incident recorded as the Vishnu-Katyayani Samvada of the Padma Purana. This is a conversation between Lord Vishnu and Katyayani (Parvati), Lord Shiva's wife. The story is that one time the great sage Narada Muni acquired the maha-prasada, personal food remnants, of Lord Narayana, Vishnu, and gave a morsel to his friend Lord Shiva. Shiva tasted it and he began to dance in ecstasy, to the point of disturbing the earth. When he was approached by Parvati about why he was dancing so, he explained what happened. However, she was unhappy and angry that he did not share any with her. Being devoted to Lord Vishnu and concerned for the spiritual well-being of all conditioned souls, she then vowed that if she should get the blessings of Lord Vishnu, she would see to it that the Lord's maha-prasada was distributed to everyone. Just then Lord Vishnu Himself appeared and conversed with her. 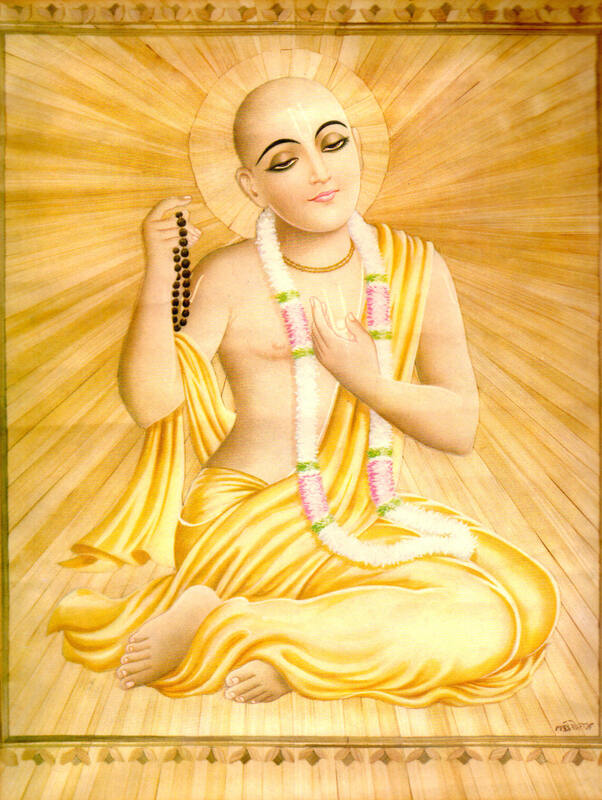 He assured her that He would appear in the world as Sri Caitanya Mahaprabhu in the age of Kali and would keep her promise and spread His mercy in the form of maha-prasada, food that has been offered to Him, and the chanting of His holy names to everyone, distributing His mercy everywhere. "A much accepted prophesy in Bengal was that someday a king would be born in Bengal as a brahmin's son, so Sri Cakravarti thought that only the future would prove whether this was the child. " Even before He took his birth, the Lord propagated the chanting of His holy name. Streams of people went for their bath in the Ganga at the time of the eclipse and all the way they chanted the Lord's name. Some, who from their birth never once uttered the Lord's name, now chanted that name on their way to the Ganga. The sound of chanting emanated from every direction and the Supreme Lord, the best of the brahmins, smiled to Himself as He made His appearance. Sri Jagannatha Misra and Srimati Sacidevi glanced at their child's beautiful face and were overcome with unbounded joy. Ladies stood around the child not knowing what to do; fussily they ululated in jubilation. Relatives and friends hurried to see the new born child; Sri Jagannatha Misra's house was a scene of great exultation. Srimati Sacidevi's father, Sri Nilambara Cakravarti, found esoteric and wonderful signs in every house of the child's astrological chart. Sri Cakravarti was astounded by the baby's beauty and saw all divine symbols on His person. A much accepted prophesy in Bengal was that someday a king would be born in Bengal as a brahmin's son, so Sri Cakravarti thought that only the future would prove whether this was the child. In the presence of all, Sri Nilambara Cakravarti, an expert astrologer, began explaining the ramifications of different astrological signs in the Lord's chart. The further he delved into the child's exalted chart, the more difficulty he found in describing the Lord's position. The child will conquer Brhaspati (the sign for learning and education) and be a scholar; He will be a natural repository of all divine qualities. Present in that gathering was a great saint in the guise of a brahman who made predictions on the Lord's future. The brahman said, "This child is the Supreme Lord Narayana Himself. He will establish the essence of all religion. "He will initiate a wonderful preaching movement and deliver the whole world. "He will give everyone that which is forever desirable even by Lord Brahma, Lord Siva or Srila Sukadeva Gosvami. "Upon seeing Him people will feel compassion for all living entities and become callous toward material pains and joys. This will be the great benediction for the whole world. "Not to mention ordinary men, even hard-core atheists will worship the child's lotus feet. "He will be glorified throughout the entire creation and people from all orders of life will come to worship Him. "He is the personification of pure Bhagavat religion (eternal religion), the benefactor of brahmanas, cows and devotees and the affectionate, devoted son of His parents. "Who can explain the imports of this child's exalted astrological and esoteric symptoms? "How fortunate you are, Sri Jagannatha Misra, a leader amongst men. I offer my obeisances to you, the illustrious father of this child. "I feel greatly fortunate that I could calculate his astrological chart. 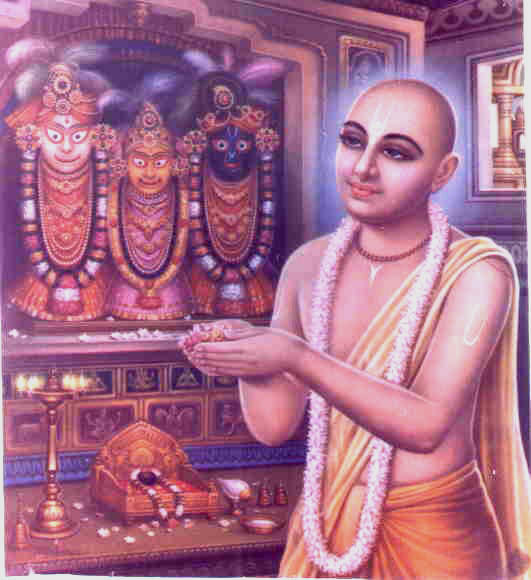 His name accordingly will be Sri Visvambhara. "He will be known to all as Navadvipa-candra (the moon of Navadvipa). He is spiritual bliss personified." The brahmin did not speak further about Lord Caitanya's pastime of accepting the renounced order of sannyasa since that would disturb the loving emotion of His parents. Sri Jagannatha Misra was enthralled with ecstasy over the descriptions of his son. He immediately wanted to offer gifts to the brahmin. He was a poor man with few possessions, yet feeling great jubilation Sri Misra fell at the brahmin's feet and cried. The brahman also caught Sri Misra's feet, and everyone present shouted "Hari, Hari" in great joy. The relatives and friends were all praise for the child, and they blessed Him as they heard the super-natural predictions about His future. Soon the musicians arrived playing their respective instruments - clay drums, flutes and shanhai (a reed instrument) - and filled the air with wonderful music. Ladies from the higher planets mingled freely yet unnoticed with the ladies from earth in this wonderful gathering. The mother of the demigods (Aditi) smiled and placed her right hand holding auspicious grass and paddy on the child's head to bless him saying, "Long life". "Please remain eternally in this material world and manifest Your pastimes". This explained the expression "Long life". Srimati Sacidevi and the others noticed the extraordinary beauty of these ladies but they hesitated to inquire about their identity. The demigods respectfully took the dust from Sacidevi's feet, and she lost her speech in extreme exultation. Neither the Vedas nor Lord Ananta Sesa could describe the waves of jubilation that drowned Sri Jagannatha Misra's house. Entire Nadia seemed to be present at Sacidevi's house to experience that undescribable joy. Wherever the people were - in their houses, or on the banks of the Ganga, or on the streets, - they all loudly chanted the Lord's name. Everyone jubilantly celebrated the Lord's birth, unknowingly thinking the festivity was actually for the lunar eclipse. Lord Caitanya appeared on the full moon night of the month of Phalguna; this day is the most worshipable by Lord Brahma and other great personalities. This day of the Lord's appearance is the holiest of holy occasions; this day is devotion personified. Lord Caitanya appeared on the full moon night of Phalguna and Lord Nityananda appeared on the 13th night of the waxing moon. Both these days are all auspicious and transcendental occasions. If one properly follows these two holy occasions he develops love of Godhead and cuts asunder the knots of material illusion. The appearance days of pure Vaisnava devotees like the appearance day of the Supreme Lord, are also all-auspicious and transcendental. Whosoever hears the narrations of Lord Caitanya's birth is freed from all miseries in life and in death. Anyone who hears Lord Caitanya's pastimes immediately gets love of God and becomes his eternal servitor; he comes with the Lord each time He advents in this material world. The Adi Khanda text is wonderful to hear because it contains descriptions of Lord Caitanya's appearance. The Vedic literature describes these pastimes of the Lord as eternal, although He sometimes appears and sometimes disappears. Lord Caitanya's pastimes have no beginning and no end; I write them down by the mercy of the Lord. I offer my humble obeisances at the Lord's feet and at the feet of all His devotees. I pray that I may be excused from all offenses. I, Vrndavana dasa, offer this song to the lotus feet of my life and soul, Lord Sri Krsna Caitanya and Lord Sri Nityananda Prabhu.